Kamehameha butterflies are one of Hawaii’s two endemic butterflies. Its Hawaiian name is pulelehua, which roughly means “to float from one flower to the next”. The name also includes the idea of reddish coloring (the lehua flower is a very similar color, especially the red ones when the sun is shining through its wings). 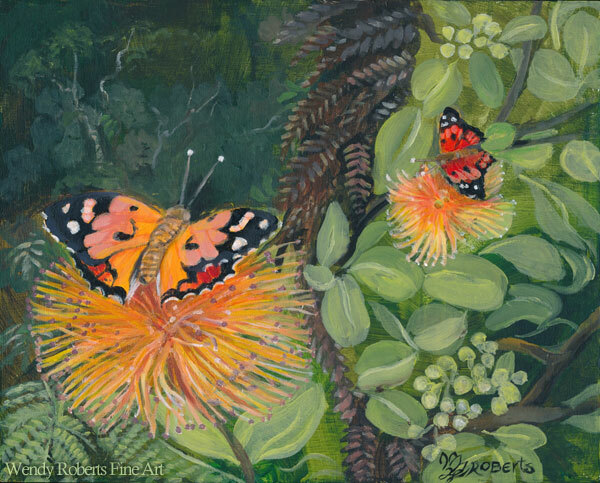 In my imagination, when I hear the term, I see a vision of an ohia flower that has come to life, floating and shimmering in the sun in the form of a butterfly as it glides from flower to flower through the forest. Perhaps it is another step in an imaginative metamorphosis for these beautiful butterflies. 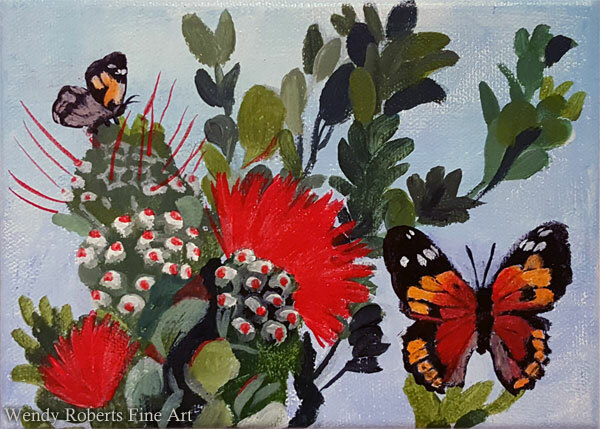 Here I have placed the small kamehameha butterflies with the ohia lehua mentioned in their name, but I wanted to see them alight on the orange variant which is a more rare color of ohia. Special thank you to Kim and Forrest Starr for their generous sharing of photos in the public domain that allowed me to render the orange lehua. 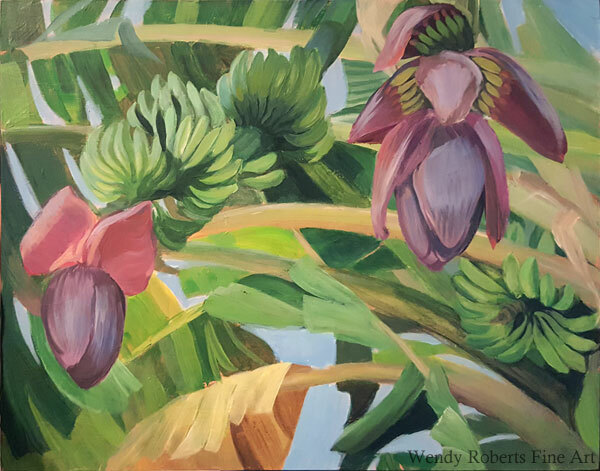 They are photographers who seek out many native and endemic plants and animals and post them online to educate and share their vast knowledge and talents with others. I do not know them personally yet, but I imagine we may meet someday (it’s a small island!). 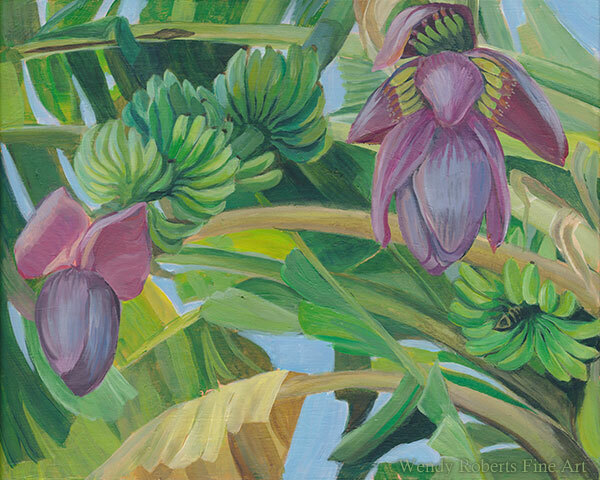 I have found their photo collection useful several times over the course of painting Hawaiian plant life and birds, and appreciate how long it takes to hike into areas with these rare endemic Hawaiian plants. It is very kind of them to share so freely with the online community! This is day 5 for me of the 30 in 30 challenge. 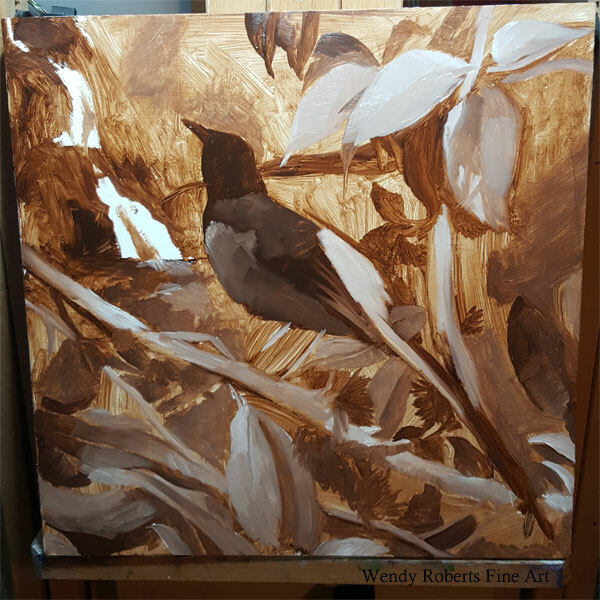 I took a quick detour from birds for a couple of days, but I know I will return at least a few times to painting them. I really enjoy birds! Tomorrow I will post my red ohia variant of kamehameha butterflies, however. 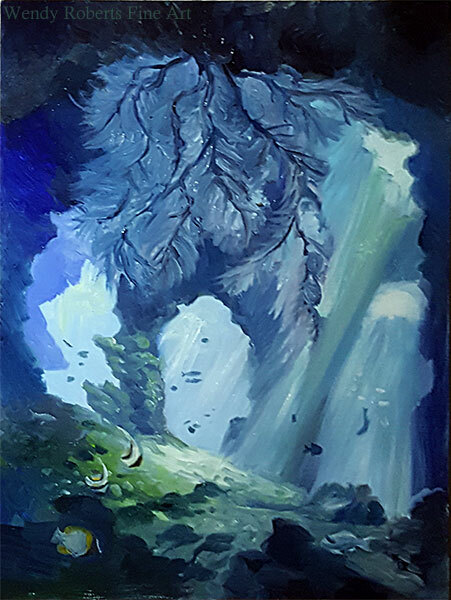 I couldn’t just paint one! Not with all the pretty colors of ohia that we have in the islands! 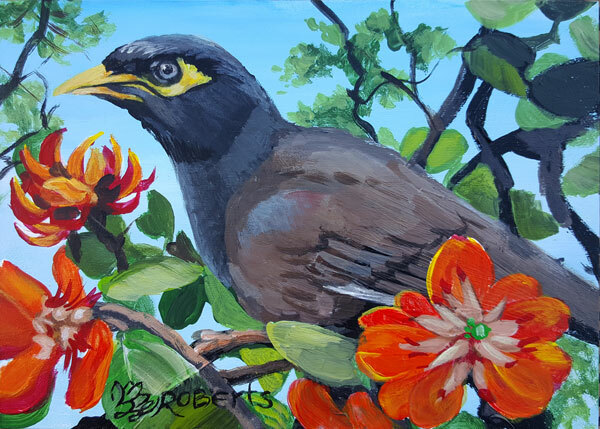 As I have been painting birds, I find myself returning to certain birds that are extra enjoyable. 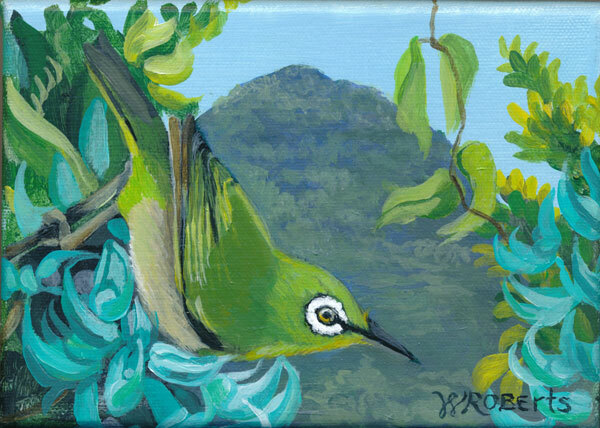 The mejiro, also known as Japanese white eye, is one of my favorite birds to paint. 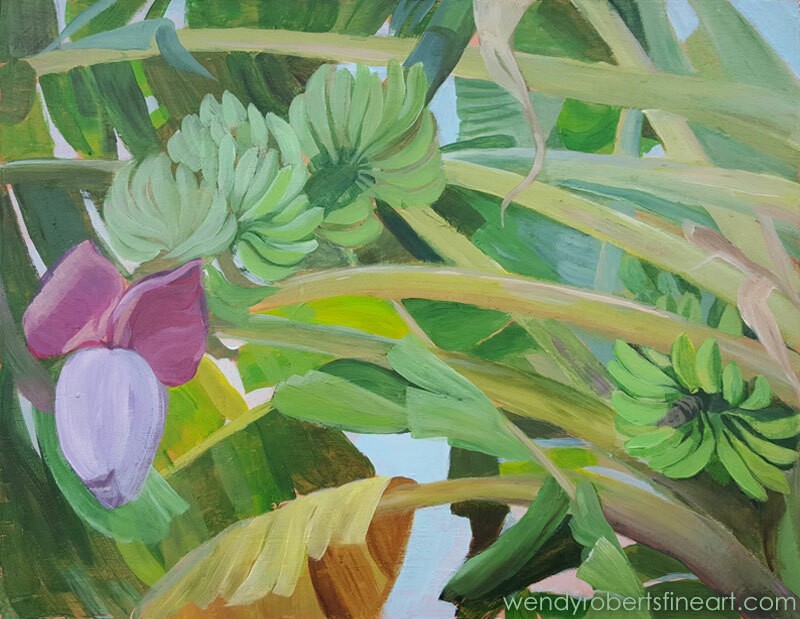 Here, I have jade vine, the only flower I know that is naturally a gorgeous turquoise combined with the green of the mejiro, the blue gray of the distant mountains, and a warm summer blue sky to create a palette of fresh, breezy blues and greens. Recently our family took a summer vacation to Maui. The largest volcano, Haleakala (Meaning House of the Sun in Hawaiian), rises up above the clouds in a cone so massive and so perpetually obscured in clouds and mists that it is impossible to understand the scale of the massive volcano. On the road to the summit, there are several biomes, and one of the most exciting landscapes was right around the visitor center where the endemic Hawaiian plants are healthy and plentiful. Mamane trees flourish there, their yellow flowers gracefully curving in bunches among the lace-like leaves. 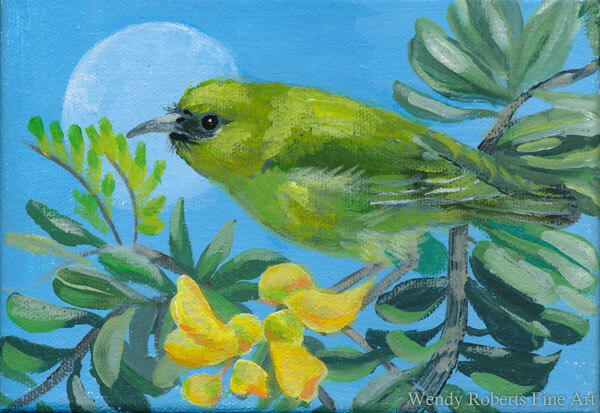 The moon was rising in the sky, and out of the corner of my eye, I glimpsed a small green honeycreeper bird gliding from tree to tree, rapidly hopping through the branches. 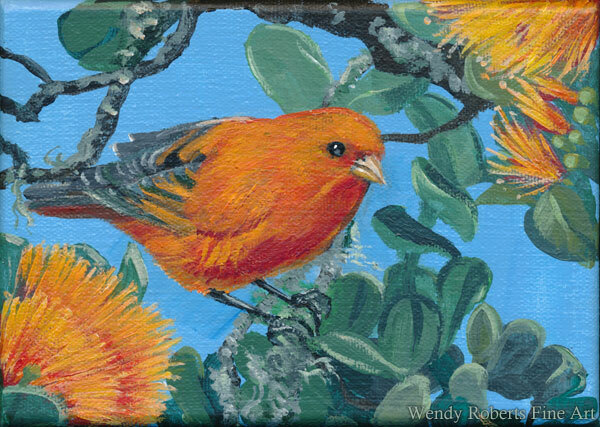 Most of the honeycreepers are gone from the forests of Oahu, so it’s a wonderful treat to see them on the neighbor islands in preserved wilderness and parks. I wanted to capture the moon, the mamane flowers, and the beautiful little bird all in one image.